I don’t bake pie nearly enough. Every time I do I wonder why I don’t make it more often. It’s actually never as time-consuming as you think it is. This morning I woke up (yawn, stretch, coffee) and made pie by 10:30am. We should do this every Sunday. It’s almost like meditating. With dough, sugar and cherries as our om. The only part that takes too long in pie baking is waiting for it to cool. Which feels like a lifetime. It takes its’ own sweet time. This pie is capping off a fairly traumatic week. I went clothing shopping. I mean, do I really need to say anything more? Seems like there is a mirror and lighting conspiracy in clothing stores working against us. Nordstrom is one of the worst offenders. I feel like they are actively trying to dissuade me from buying clothes. Because, honestly, this isn’t what I look like at home and I’m trying on clothes daily in that lighting, so I should know. I worked through the pain and still bought stuff. I’m not a rookie. I like to think of myself as someone with vision and foresight; that coated in the fresh light of day I would look completely stunning in everything I purchased regardless of what the mirrors had to say about it. So I drove home. And then I weighed myself (let out a quiet gasp), sent my scale to get re-calibrated and signed up for Weight Watchers. Which, from this point forward, will be known as Dub-Dub (courtesy of a good friend). I have since been completely paralyzed in the kitchen. Where’s the butter? Where’s the cream? I spent the rest of the week researching thyroid disorders. Thank goodness I’ve made cherry pie a zillion times. Stella likes it in lieu of birthday cake. I love it whenever I can get my hands on a slice. My mom makes the absolute best cherry pie on the planet. For breakfast? Duh. When someone said ‘pie contest’ I really had no other option. I had to make this pie. So I put on some non-binding sweats and made cherry pie for charity. I vicariously tasted. Every. Last. Bite. Vodka. I use the Cook’s Illustrated vodka pie crust recipe. There really is no better (in my book). Before I do anything I put the vodka and water in the freezer to make sure they are super chill. If you use the cookie cutter top method, you will have extra dough. I like that. If I have just enough dough it makes me nervous. I like to know that I can cover my mistakes if need be. Cherries. I love the Oregon Fruit Tart Cherries. Regardless of brand, you want them in water or a light syrup. Don’t panic, it’s organic. My best advice when dealing with dough is to not panic. If you get a hole in the crust, don’t fret. Simply use some excess dough to patch up the hole. 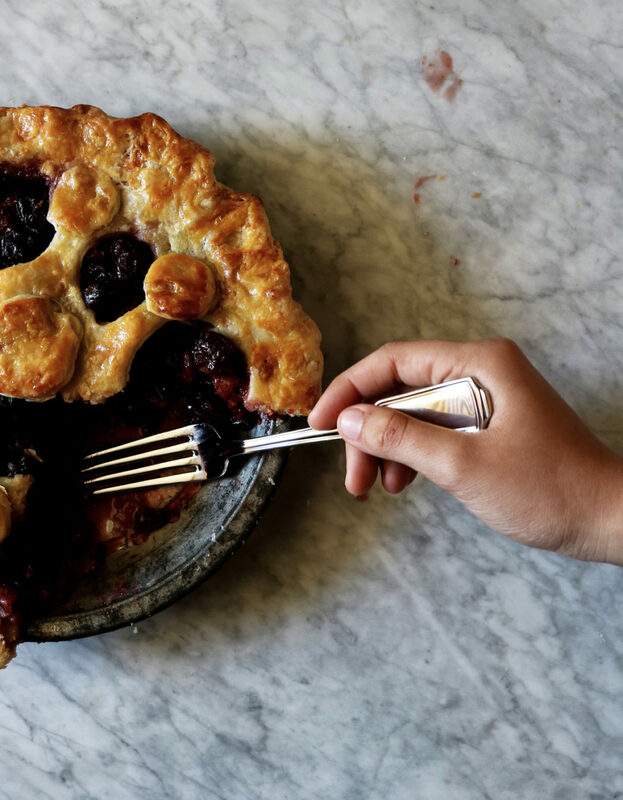 Pies are beautiful when rustic and imperfect. So just go with any anomalies and act like it was supposed to be that way. Making it pretty. I am HORRIBLE at making a pie look pretty in the traditional pie-making style. However, give me some cookie cutters and I’m all good. Drinking & pie-making. As much as I think drinking and cooking go hand-in-hand (pengyous for life) I don’t believe the same is true for pie-making unless you are the most experienced pie-maker on the planet. Wait until the pie is in the oven and then grab some more chilled vodka, muddle in some cherries, a couple tablespoons of simple syrup, a sprinkle of five-spice powder and a little soda water and you’re good to go. Don’t forget the ice. Always make your pie crust first so that it can get its’ proper chill on. Place your vodka/water mix in the freezer so that it can get super cold. Mix the flour, salt and sugar in a large bowl until well blended. Cut up your butter and shortening into even-sized chunks and sprinkle on top of the flour mixture. Using a pastry blender or your hands, mix the butter and shortening into the flour until there are large pea-sized chunks. Don’t over mix your dough here. Grab your vodka/water mixture out of the freezer and drizzle on the top of the flour/butter/shortening mixture. Using a spatula, fluff around the flour until everything is getting blended together and a ball is starting to form. Use the back of the spatula to press the dough together. If you need to get in there with your hands and force the issue please do so. Sometimes rogue flour bits get on the bottom of the bowl and don’t want to incorporate…scoop them up and blend them into the dough mix. Separate your dough into two balls. Pat down into discs and wrap tightly in plastic wrap. Set in the fridge to relax a bit. Chill for 30 minutes. In a large bowl, mix together the drained cherries, sugar, cornstarch, juice, five-spice and almond/vanilla extract. Mix well and let it sit for a bit. Preheat your oven to 425 degrees F. Make sure a rack is in the middle of the oven. Prep a cutting board (or clean counter top) with a dusting of flour. Also flour your rolling pin and your hands. Grab one disc of dough once the time has gone off and rest on the cutting board. 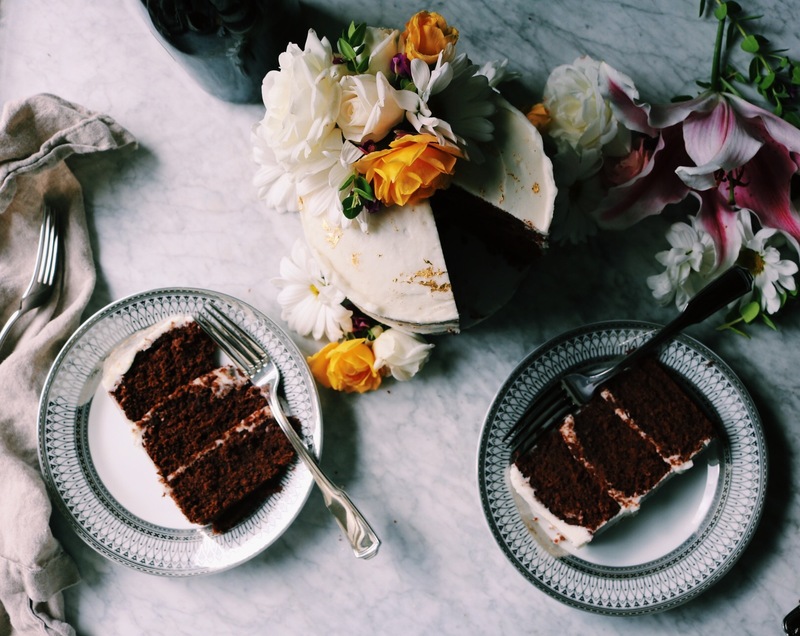 Grab your pie plate and hold it over the cutting board. You want to imagine rolling the dough 1 inch-ish beyond the circumference of the pie plate. Keep that sizing in your head as you roll out the dough. Periodically check to make sure the dough isn’t sticking to the cutting board. If it is, don’t stress. Grab a spatula and some extra flour. Sprinkle the flour close to the sticking spot and use the spatula to gently coax the dough away from the board. You want your dough thin, but not so thin it’s see-through or hard to handle. Conversely you don’t want it so thick that you get a huge mouth full of dough with every bite. It’s a dance for sure. You’ll get there. Don’t move too fast, relax and get in the zone. Feel the dough, be the dough. Gently and slowly roll the dough onto your well-floured rolling pin. Then gently unroll the dough into the pie dish, taking care that it is centered. 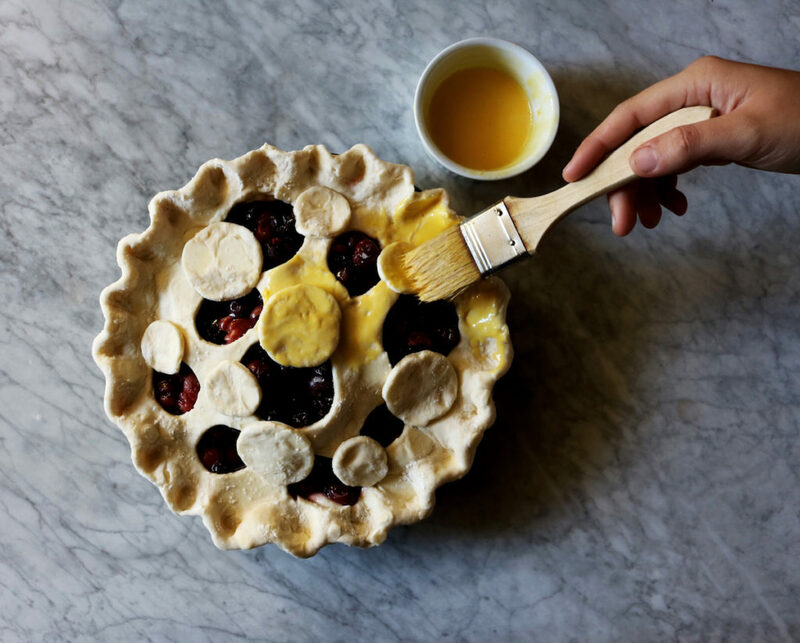 Grab some kitchen scissors and cut the dough that hangs over the outer edge of the pie dish. Reserve any of this dough for any holes, thins spots or areas where the dough didn’t quite make it to the edge of the pie dish. I mean, nobody is perfect. If you have any of the above, then quickly whisk together your egg wash (egg plus milk/cream), brush the area you need to repair and gently press some of this excess dough over the top like a bandaid. No one will ever know. It’s our secret. Set your crust in the freezer (or refrigerator) while you work with the other dough disc. Grab your other dough disc. Re-flour the cutting board, rolling pin and hands. Roll this disc out to a similar thickness. 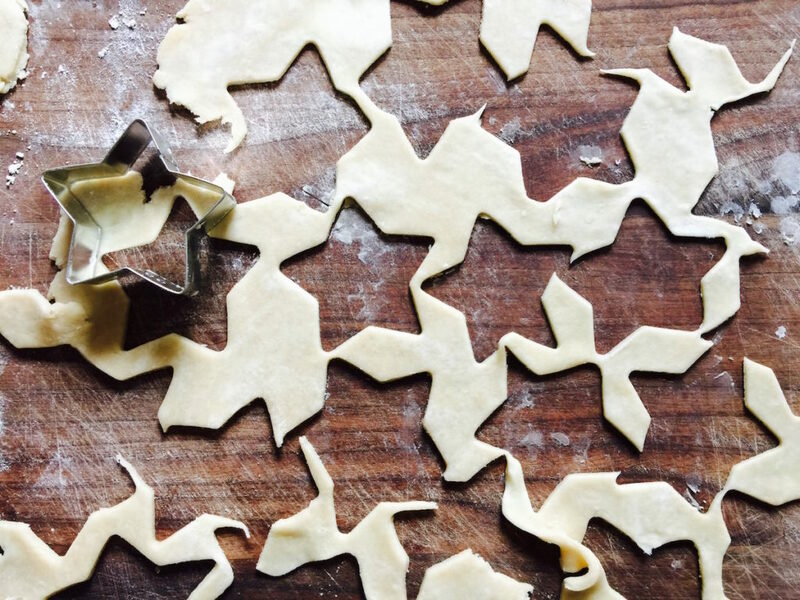 Using cookie cutters, start cutting the dough. Make sure you get as many cuts as possible without having to re-roll your dough. You want to work your dough as little as possible. Brush the edge of the pie crust with your egg wash.
Lay your cutouts around the edge of the crust. They can overlap a little. Gently press down so that they adhere a bit to the crust underneath. Place remaining cut-outs in the middle of the pie — let your imagination go crazy. Get funky. Brush all of the cut-outs with the egg wash and then sprinkle (with a heavy hand) the granulated sugar. Place the pie on a rimmed baking sheet in the middle of the preheated oven for 25 minutes. Check your edges…are they getting too brown? If they are, at any point in the baking process, cover them with foil (not too exact, just cover them) to keep them from burning. After 25 minutes, turn the heat to 350 degrees F and continue baking for 25-35 minutes or until the filling is bubbling and the edges are browned. Set your pie on a cooling rack and literally count the seconds until you can take a bit. I mean hours. She’s going to take awhile. Grab another cocktail, a book and just chill. There’s always more going on than we know about. Interesting read. Let’s stay informed. This made me giggle. Numa Numa. Do you want sugar in your coffee if it will help the environment? Umm…aside from the tragic shopping trip, that’s all I have for you. It’s almost summer. I can taste it. Planting my summer garden (peas, green beans, peppers, tomatoes, squash, zucchini and a stupid amount of herbs). Although I planted some lemon thyme which is showing promise as a cocktail companion. More news on that soon. Chick update: they are now able to wander about 20 feet from the coop and if anyone goes near them they all scurry back inside. I wish they had chicken diapers so we could bring them in the house. They’re that cute. Is that a thing? Chicken diapers? We should invent this. I hit publish before all my edits were saved on this post. Sorry newsletter subscribers for getting that in your inbox too early. Another premature post. Sigh. Make pie. It will make you happy. 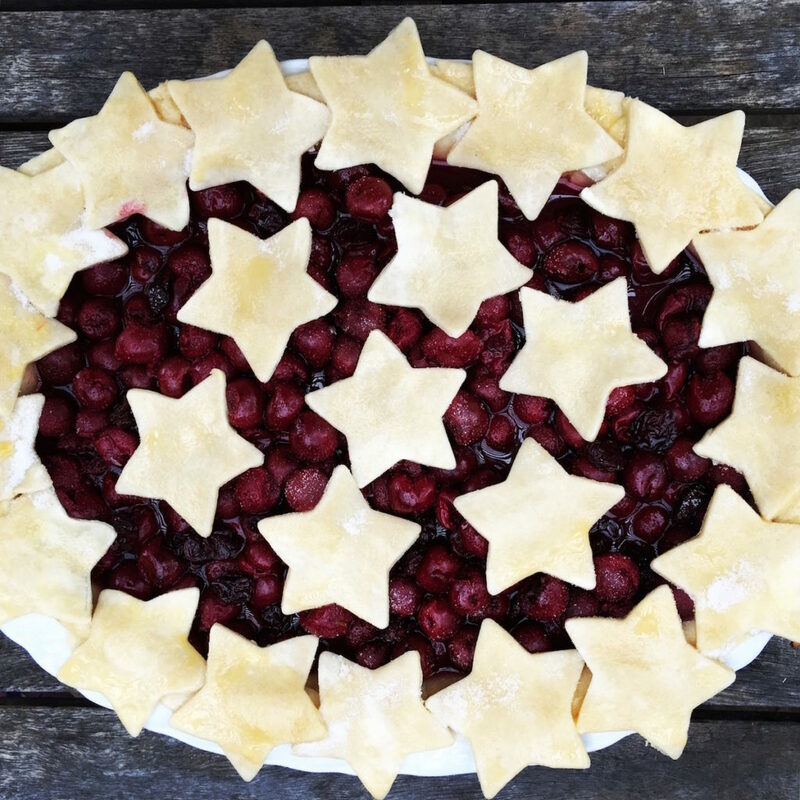 Finally, a yummy cherry pie recipe. I’ll be making it very soon. What are the five spices? I believe I missed that detail somehow. Whoa – vodka pie crust?! Never heard of it but I think it just changed my life. And it’s so true, waiting for the pie to cool really does take the most time. 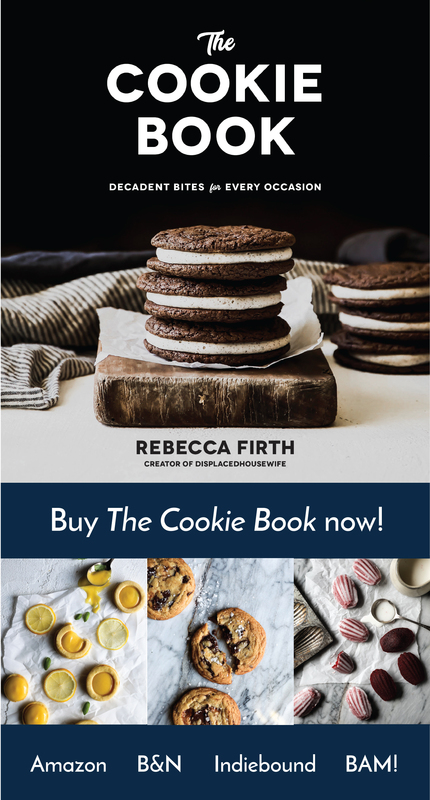 I feel you on the shopping – how can I still eat cookies and pie and fit into my clothes without exercising?! I can’t, so one of those has to give and I don’t know which one it has to be yet. Ha! Ha! 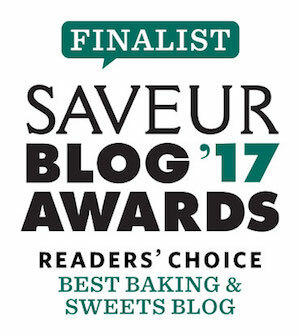 I have been sampling the buttercream too liberally myself and am now in the process of de-carbing. Agree that Nordstrom and other such retailers must use fun house mirrors in their dressing rooms. Anyhow, cherries are one of my favorite fruits (sigh! no cherries for me) and this pie looks incredible. Looks like I will be making it for hubby and co-workers as I scarf down my chicken.